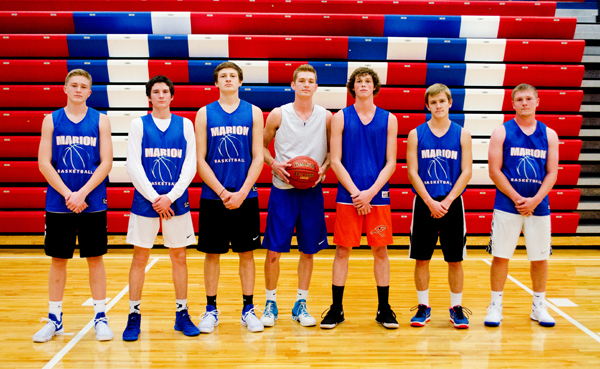 These seniors and returning letter-winners will bring experience and leadership to the court this season for the Marion boys’ basketball team: (from left) Eli Hett, Sam Zinn, Chase Stringer, Zachary Stuchlik, Noah Dalrymple, Colin Williams, Evann Heidebrecht. Not pictured: Blaine Mermis. If last year was a season of growing pains for the Marion boys’ basketball team, second-year coach Randy Skiles looks ahead with optimism for a continuation of growth that became evident as the season ended. The Warriors went 5-16 last season, including 1-7 in Heart of America league play, ending the season with a string of 10 defeats. In the Warriors’ final game of the season, they showed evidence of improvement, when, faced with a rematch against Council Grove in the Class 3A sub-state quarterfinals, the Warriors lost only by seven, 50-43, after suffering an earlier defeat by a 64-38 margin. Marion will play without three graduated seniors: Nathan Baldwin, Peyton Heidebrecht and Mason Pedersen, and will make a return to Class 2A when taking to the court this year. Two returning starters highlight Marion’s 25-man roster. Senior Zachary Stuchlik is a 6-foot, 3-inch guard/forward who received All-HOA honorable mention a year ago with per-game averages of 11 points and six rebounds. Junior Noah Dalrymple (6-4) also returns with starting experience. The forward/center averaged four points and five rebounds per game in his first year with the team. Six additional letter-winners return to make contributions on the court. Junior Evann Heide­brecht (5-10) will be called upon to handle the ball at point guard. These athletes will contribute inside as well: junior forward Chase Stringer (6-3), junior forward/center Blaine Mermis (6-5) and senior forward Colin Williams (5-10). Skiles said he expects improved post play this year. Junior guards Sam Zinn (5-11) and Eli Hett (5-10) round out the returning letter-winners. Heading into his second year at Marion, Skiles said he not only has learned more about the athletes he’s coaching, but he also was able to begin preparing for the season in the summer, a luxury he did not have last season. Skiles said the team will seek continued growth and improvement each week. “We just need to go out and play and see where we’re at,” he said. “We’ll be fine. Marion will host South­east of Saline in its season-opener Friday.